All Hawaii volcanoes have their own distinct features. While the entire chain of Hawaiian volcanoes extends more than 3000 miles (nearly 5000 km) across the Pacific Ocean, most have been quiet for hundreds of thousands, even millions of years. Six volcanoes coalesced, or joined, to form the Big Island. The 6 Hawaii Island volcanoes are (listed here from north to south): Mahukona Volcano, Kohala Volcano, Mauna Kea Volcano, Mauna Loa Volcano, Hualalai Volcano and Kilauea. 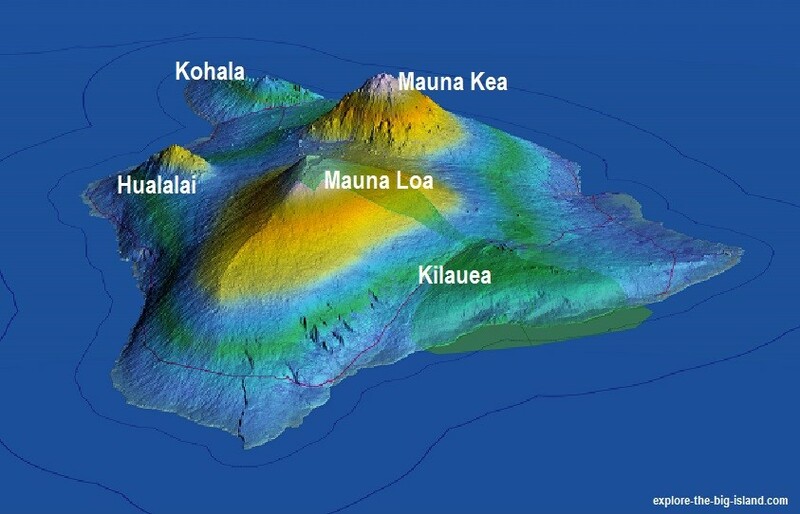 Mahukona is an extinct volcano, submerged roughly 1200 meters beneath the ocean's surface and approximately 30 miles (48 km) west of Kohala off the northwest coast of the Big Island. Its last eruption was more than 400,000 years ago. Lava flows from Hualalai and Kohala volcanoes (along with coral deposits) have buried most of Mahukona Volcano. Of all the Hawaiian volcanoes, only Kilauea Volcano is currently erupting, as it has been doing continuously for more than thirty years, since January 1983. Most of the flows from the Kilauea eruption have been in a southerly direction from the Pu'u 'Ō'ō spatter cone on Kilauea's summit. Can you walk to the lava flow? Can you watch lava flowing into the ocean? Your opportunity to view Kilauea's lava flow is inconsistent at best. For years you could almost always count on being able to watch molten lava ooze straight into the ocean. The ocean entry stopped abruptly in March 2011 when the floor of the Pu‘u ‘O‘o crater collapsed and redirected the flow. Since that time lava flow has been unpredictable. Beginning in July, 2016, Kilauea's lava flow once again began entering the ocean at Kamokuna, creating quite a show. Of course, things can change at a moment's notice with an active volcano in Hawaii, depending on the whims of Pele, goddess of fire and Hawaiian volcanoes. This Big Island volcano can be very temperamental! Today's most current information on the Kilauea eruption can be found on the National Park Service website. If you are hoping to see actual lava flow during your Hawaii vacation, be sure to check here for updates. Fun for the entire family, Hawaii Volcanoes National Park is a great place to explore and learn more about Kilauea and all the Hawaii Island volcanoes. You can see steam vents and the stunning Kilauea caldera (summit crater), visit the Jaggar Museum on volcanology, and walk through the amazing Thurston Lava Tube. Tons of great hiking too, from easy to strenuous. Hawaii Volcanoes National Park is located about 50 minutes from Hilo, and about 2-hours from Kailua-Kona. Mauna Kea Volcano is one of the most interesting Hawaii Island volcanoes. 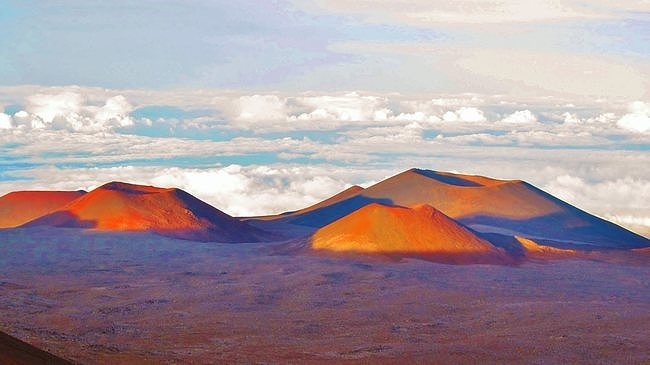 Considered dormant (a sleeping giant), Mauna Kea last erupted about 3,500 years ago. 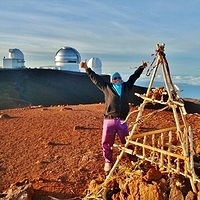 Mauna Kea is the tallest mountain in the world when measured from its base on the seafloor. Just below the summit, mysterious Lake Waiau is one of the highest lakes in the US. 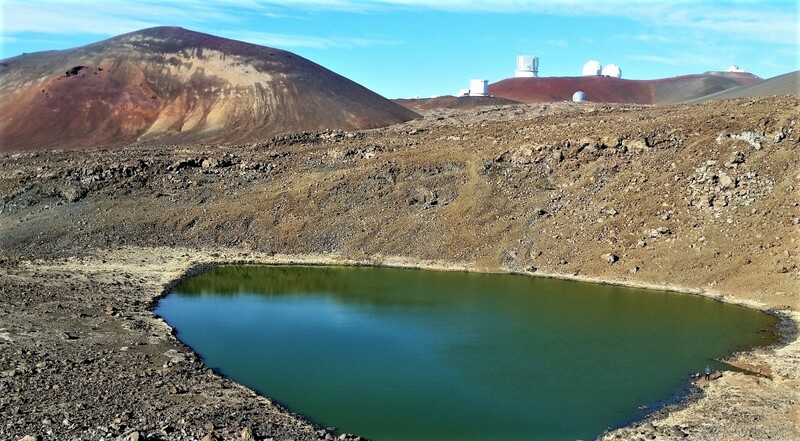 The Mauna Kea Observatory, the world's largest astronomical research facility, is also located near the top of Mauna Kea, visible in this photo above Lake Waiau. 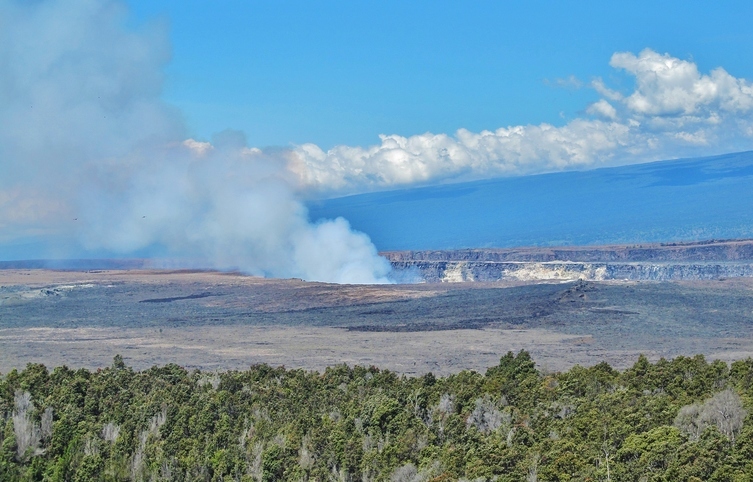 While Kilauea may be the most famous Hawaii volcano, Mauna Loa and Hualalai are also active volcanoes. To be considered active, a volcano will have erupted at least once in the last 10,000 years, and there continues to be sufficient seismic activity below the surface to suggest that another eruption may occur in the next 1000 years or less. 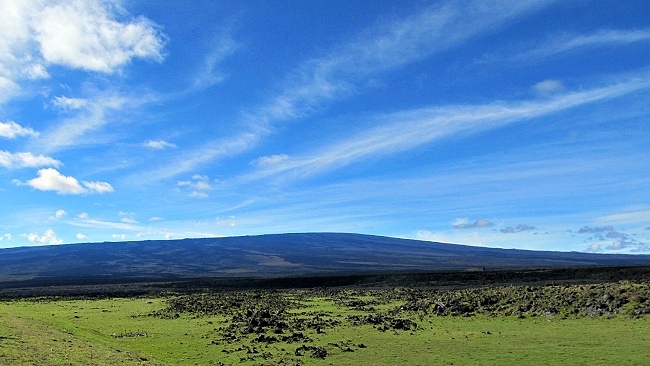 Mauna Loa is the largest volcano in the world. 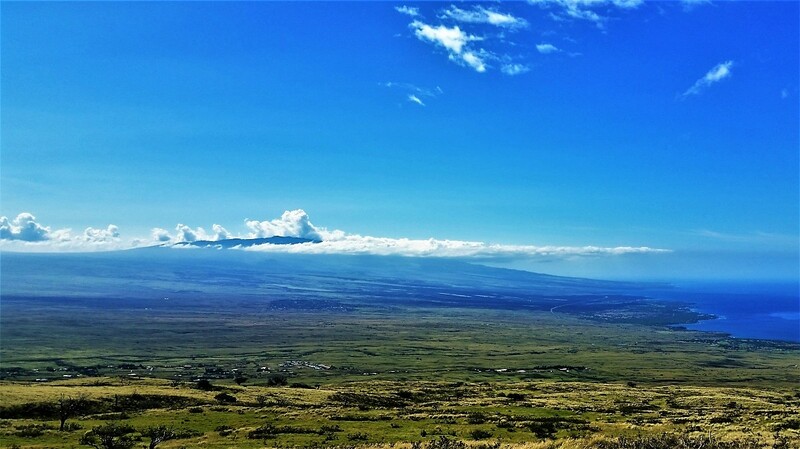 With an elevation of 13,677 feet (4169 meters) above sea level, Mauna Loa stands an impressive 30,077 feet (9167 meters) tall from its base on the ocean floor. It is roughly 3400 feet (1036 meters) shorter than Mauna Kea and second only to Kilauea as the most active volcano on the Big Island, erupting at least 33 times since 1843, most recently in 1984. Hualalai Volcano is the third most active volcano on the Big Island. 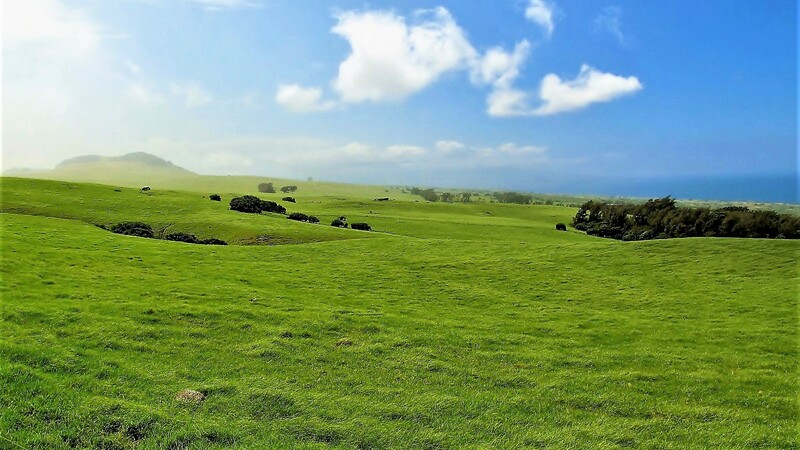 Hualalai has historically erupted an average of 2-3 times every 1000 years. It's most recent eruption was in 1801. In the image below, Hualalai rises above Kailua-Kona on the west coast of the Big Island. Looking south from Kohala Volcano 40 miles (64k) north of Kona, the outskirts of Waimea (Kamuela) are visible in the foreground. In 1929, intense earthquake activity beneath the surface, lasting for several weeks, was likely caused by rising magma. Because of this and the fact that it has been over 200 years since its last eruption, Hualalai Volcano is considered a potentially dangerous Hawaii Island volcano that is overdue for an eruption. However, subsurface activity is continuously monitored, and there has been no recent unusual seismicity. 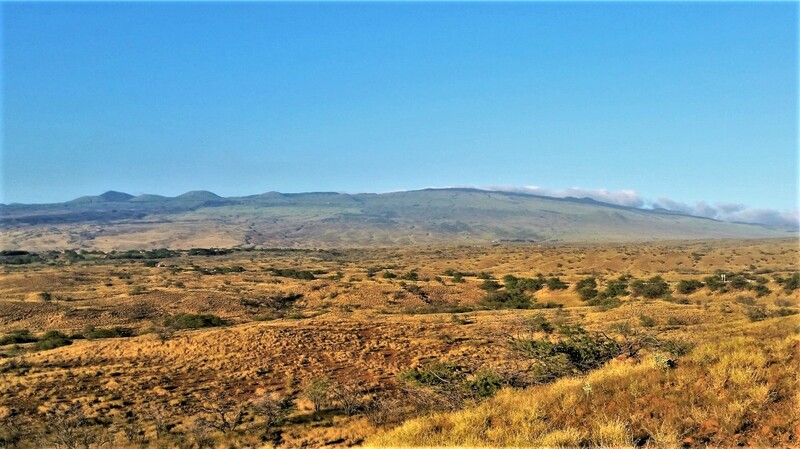 Just northwest of Mauna Kea Volcano, Kohala Volcano is considered extinct, having last erupted 60,000 years ago. Many of the premier Big Island Resorts are built along what is often referred to as the Kohala Coast, although the true coast of the Kohala Volcano is farther to the north. Hawi and Kapa'au are built on the northern point of this lush volcano, and the town of Waimea sits on its southeast flank. Hawaii volcanoes are known as shield volcanoes due to the characteristic shape they take on as the lava flows outward. This type of volcanic eruption is called a Hawaiian eruption. Learn more about how Hawaii Island volcanoes are formed, including types of lava and the creation of the entire Hawaiian Emperor Chain.